Global Market Insights has recently added a report on Building Thermal Insulation Market which provides a succinct analysis of the market size, revenue forecast, and the regional landscape of this industry. The report also highlights the major challenges and current growth strategies adopted by the prominent companies that are a part of the dynamic competitive spectrum of this business sphere. Wool insulation material contributes more than 50% of consumption in Building Thermal Insulation Market in 2016. Increasing demand from commercial and residential construction will drive the product demand. It is extensively used in sheets & blankets form with a temperature sustaining capacity of above 400 degrees Celsius. UAE is anticipated to worth more than USD 260 million in 2016 and has become one of the most attractive hub for infrastructure spending. Increased adoption of technologies for curbing hot weather conditions, greenhouse gases and improved business environment will strengthen the product demand. High energy saving, reduced carbon footprints, and easy product availability are key factors fueling building thermal insulation market. Heat loss in a building through its walls, roofs and floors accounts for more than 70%. Benefits offered such as room temperature maintenance at minimum possible energy consumption will increase the product penetration. Increasing adoption rate of International Energy Conservation Code (IECC) from 2012 has stimulated product growth in construction sector. Additionally, government norms corresponding to limited greenhouse gas emissions and energy conservation is anticipated to drive building thermal insulation market. 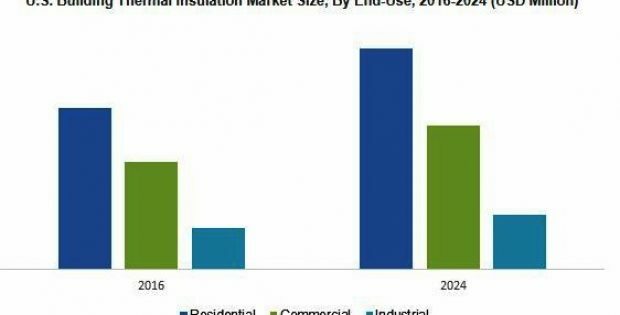 Building Thermal Insulation Market size is estimated to exceed USD 34.9 billion by 2024. Rising demand for energy conservation and high growth in construction spending will propel building thermal insulation market. Global construction industry was valued above USD 7 trillion in 2015 and will exceed USD 14 trillion by 2024. China, U.S and India together accounted for nearly 55% share in the same year. Expanded polystyrene will witness 4.2% CAGR up to 2024. Superior properties including lightness, durability and process ability of the material have enhanced the industry growth. It offers similar thermal resistance as that of its counterparts with even lesser quantity due to high R-value. Ease of installation, along with high moisture sensitivity, compressive strength, better thermal conductivity and durability are key properties encouraging product penetration. Technological enhancement such as multi chamber profiles, double and triple insulated glass will promote industry growth. Residential market is set to grow over 4% through to 2024. High consumer spending, nuclear family evolutions, and rising population will have a positive influence product demand. Global industry share includes Dow, Owens Corning, Johns Manville, Huntsman International, CertainTeed, Kingspan Group, BASF Polyurethanes, and Saint-Gobain.